Summary: In this post, I’d like to share some of the critical functions performed by the latest edition of Stellar Repair for Exchange Software and how organizations of all sizes using on-premises Exchange can benefit from using this product. It also unveils exciting features for Exchange Administrators who are thinking about drafting a Disaster Recovery plan for Exchange. Exchange Admins are always on the lookout to keep the Exchange up and running and meet the organization’s growing communication needs. However hard these Admins try, Exchange does encounter server or database related issues, and the outcome is Exchange database inaccessibility. Resolving the errors with Microsoft suggested utilities is not just time taking but also complicated. Instead, an innovative Exchange recovery software such as Stellar Repair for Exchange ensures fast and complete Exchange data recovery. Reason being, this software fixes even the most corrupt Exchange Database (EDB) files and ensures EDB recovery within a short span. b. Repair, recover and restore specific or all mailboxes of a single or multiple EDB files. c. Recover all contents like emails, contacts, calendars, tasks, journals and Public Folders. The software with its advanced algorithms scans through the corrupt database and repairs the file. Exchange Admins can verify the scanned EDB through Search Criteria. This Search Criterion helps Admins to get accurate search results for their eDiscovery queries. The eDiscovery feature of Search Criteria helps in legal searches across the organization by using the Content indexes created by software search. It bypasses the complexities of delegating the discovery tasks to non-technical persons and hence there is no need to provide ‘Role-based Access Control’ to non-Exchange users. The Search Criteria of the software also allows Admins to save emails and other mail components as per Date, attachments, and more. The main menu of EDB Recovery software provides an option to save the scanned EDB in multiple formats such as PST, MSG, EML, HTML, RTF & PDF formats. Save the entire EDB file in PST format, else select the desired folders, emails or mail components and save these in preferred file format. This EDB Recovery software provides an option to export mailboxes from an offline Exchange to online Exchange; precisely, in those cases where Exchange database becomes inaccessible owing to the issues on Exchange server. Organizations are also using this software to migrate the Exchange Database while upgrading from a lower to a higher Exchange version, say from Exchange 2008 to Exchange 2010. While exporting from Exchange 2008 to Exchange 2010, the software acts as Exchange 2010 EDB recovery software. 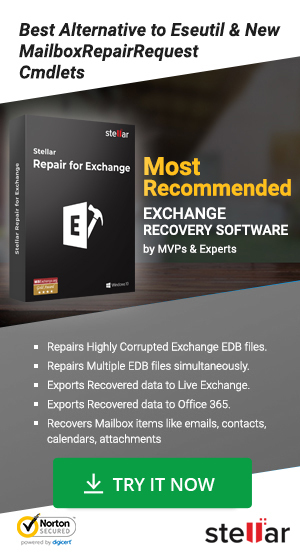 The Stellar Repair for Exchange software provides a hassle-free solution when the mid-size and small-size organizations are opting to export their mailboxes from on-premises Exchange to Microsoft Office365. Stellar Repair for Exchange is one of the most innovative solutions to export mailboxes to Office 365. As the software ensures scanning and repairing of EDBs before exporting these files, it ensures that the corrupt EDBs are never exported. Exchange Server crash, Dirty Shutdown error, Database fails to mount, etc. are some of the problems faced by Exchange Admins that result in Exchange database inaccessibility. Stellar Repair for Exchange software repairs the corrupt Exchange database and restores it when the server encounters any of the above-stated issues. Admins have an option to repair EDB and save it as PST file. Next, they can restore Exchange server with new server configuration and Exchange roles and restore mailboxes (as saved in PST format) on Exchange server. The Save and Load Scan feature allows Exchange Admins to scan and repair the corrupt Exchange database and save the scanned file in DAT format. After a time gap, Admins can upload this DAT file by using the Stellar software to save it in the preferred format. This way Exchange Admins can schedule the recovery of Exchange database. As the scanned database is free from corruption, hence the saved DAT file acts as a ready backup of Exchange database till that date. Admins can quickly recover Exchange database from the DAT file, whenever required. A Log Report highlighting the number of repaired components is also available – after the software performs complete recovery – in the software to help analyze the Recovery Report. Select the EDB file if you are aware of the location. In case the location is not known, click the ‘Find EDB’ button, followed by Start button. Quick Scan and Deep scan: click on Quick Scan if the database is not severely corrupt. Alternatively, select the Extensive Scan option followed by Ok button. Once the scanning process is complete, verify the EDB file components with the available preview. An option to add multiple EDB files is also available with the software. Answer in affirmative, if required. Once the file scanning and verification processes are complete, click on Save button to start the Saving process. There are different Saving Options available – PST, MSG, EML, HTML, RTF, and PDF formats. Select the one which suits the requirement. Fill in the location to save the file and confirm, and the mailbox on the EDB file is saved in the preferred format. Connection Option screen pops-up. Fill in the Exchange server and login details and click Ok button. And the connected mailboxes are exported directly on Exchange server. Similarly, export mailboxes to Office 365 account. Follow this link for detailed steps on mailbox Exchange recovery. Exchange Admins are always on the lookout to keep the Exchange up and running and meet the organization’s growing communication needs. However, Exchange issues are not uncommon, hence including a reliable Exchange Recovery software such as Stellar Repair for Exchange in the Exchange Disaster Recovery Plan ensures that the organization remains productive and collaborates effectively. Additionally, EDB recovery tool frees the Exchange Administrators from unnecessary tensions arising out of Exchange server related issues. The mailbox exchange recovery software not only helps in recovering the database but also ensures Exchange database protection. The advanced recovery features of this software help in retrieving, exporting, and preserving EDB files. Exchange 2013/2010/2007 Database is Not Mounting after Restore – Fixed!